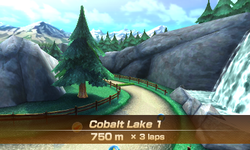 Cobalt Lake 1 is the first track of the Cobalt Lake area and the first track of the Flower Cup in the horse racing mode of Mario Sports Superstars. 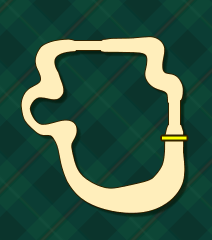 As with all first tracks of each course, it is the track featured in the outing of Cobalt Lake if players decide to take their horse there in stable mode. Cobalt Lake 1 has a distance of 700m, which is tied with Cobalt Lake 3 for having the shortest distance in the game. The track itself has a relatively simple layout, though it has areas that players can cut through the grass and water with alongside some hedges and raised platforms in the form of rocks. Players first cross a wooden bridge before making a left, potentially grabbing carrots or items depending if they are in the inside or outside of the road. Players then jump over hedges and cross a stone bridge, where many stars and a carrot can be obtained if players jump over the hedges. After the bridge, players make a gentle turn to the left, where they jump over hedges to obtain items; these hedges are not present when players take their horse to the outing version of the course. They can then either cut through the grass through the curving road with a Star Dash or obtain more items on the outside, winding road. Past the road, players can choose to take the boost panel on the left portion of the road to speed up or take the right path and opt to collect some carrots. On the last curve of the track before the finish line, players can jump on the raised rocks to cut on the inside of the track while obtaining a star and a carrot or go on the outside portion of the road to collect a bundle of stars. Before the stone bridge, with hedges to jump over and stars and carrots on top of the hedges. Past the bridge, with a turn and hedges to jump over. After the winding road, with carrots on the right and a dash panel on the left. Near the end of the track, with rocks on top of water to the left and stars to the right. This page was last edited on September 10, 2018, at 22:14.